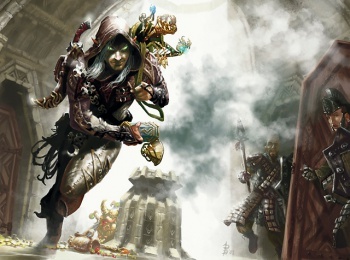 Wizards has revealed D&D 5th Edition's encounter-building guidelines. In his latest Legends & Lore column, D&D 5th Edition Lead Designer Mike Mearls outlines the not-yet-final guidelines on building combat encounters in the latest iteration of the tabletop classic. Every monster now has both a Challenge Rating and an XP value, and monsters with a CR higher than the party's level are considered very dangerous to the player characters. Encounter difficulty is separated into four groups (easy, moderate, challenging, hard) based on monster XP totals per level, and adventurers are expected to be able to handle the XP equivalent of two hard encounters before taking a long rest. The system, overall, seems fine - no more or less complicated than 3.5's or 4e's encounter building system - though it does lead me to question why the developers feel the need to change the system with every iteration of the game. The guidelines on how to handle great numbers of monsters are unpleasantly complex and explained in text rather than in a table, making them appear especially cumbersome. Overall, the tone of the article feels apologetic and overly cautious, and the impression I get is that Mearls isn't at all confident in the balance of the system. In my opinion, he is leaning way too much toward playing the rules fast and loose - he reiterates multiple times that these are simply rough guidelines and that DMs needn't really follow them. "As a DM, you'll start to develop a feel for what kind of encounters your players' party can handle. At that point, feel free to rely more on your own judgment than the numbers in these tables." But, hey - what do I know? Regardless, I'm still optimistic about 5e. I just hope this encounter building system can be tightened up and made balanced before the Dungeon Master's Guide releases in November.